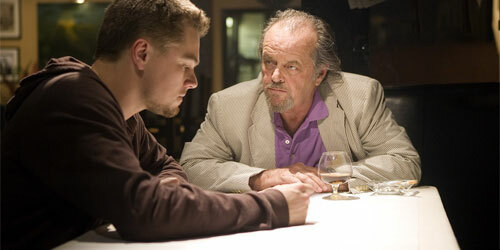 Finally managed to catch The Departed before it disappeared from the big screen. I’m not sure what I think of it. Having seen and enjoyed Infernal Affairs in the cinema, there was nothing quite as startling in Scorsese’s film. Having read several reviews, I think I’m with J. Hoberman in Village Voice. The Departed is much longer than Infernal Affairs but it doesn’t do a great deal more. It is, of course, extremely well-made and very enjoyable as a genre film, but tight and lean it isn’t. It also lacks , for me, real interest in characters. I was prompted to think of a movie I love a great deal — Donnie Brasco (1997) in which Johnny Depp plays the undercover cop and Al Pacino the low grade mafioso who becomes his surrogate father. By packing The Departed with the likes of Jack Nicholson and Martin Sheen, Scorsese seems to be going for depth in the playing, but Nicholson can’t for me achieve the force of Pacino and Depp is leagues ahead of Matt Damon, DiCaprio (one of his better performances) and Mark Wahlberg (an odd and well received performance). I worry that it is my own old man’s view and also possibly my arthouse snobbery, but no-one in The Departed gets within ten miles of Tony Leung, so cool he is frozen. I think Marty got caught between two stools with this movie. It should have been shorter, tighter and more generic without big stars or more psychologically profound/more melodramatic (I did like Vera Farmiga, whose part could have been expanded). So, I enjoyed the film but it could have been more. Rather like Michael Mann with Miami Vice, Scorsese knows so much that when he doesn’t blow your socks right off it is a little disappointing. It is probably flying in the face of all reason and most polls, but I found both Gangs of New York and The Aviator to be more exciting in terms of watching a great filmmaker stretch himself. I agree that it doesn’t ignite somehow – although Di Caprio somehow manages to convey psychological depth to his character out of not much script. It was very watchable, but seemed, weirdly, like Scorsese creating a pastiche of his own work. We were back in the gangster genre, but I have a problem with Nicholson. He seems to have gone too far down the road of laughing at his own image (although de Niro has beaten him by miles) to be a believable, and disturbing, good/bad, father/boss figure. Day-Lewis really caught that in “Gangs” anyway. For me, there was that strange moment when Damon dismissed any father-son spin on their relationship, just before he shoots him – left me thinking, what was the whole film about then? If it’s brothers, then I agree that “Infernal Affairs” brought that to life much better – or is that my snobbery because Asian cinema seems more properly “high culture’ than Hollywood? Hope not!Linking to awards – won’t Scorsese win for this anyway, whatever critical judgements are circulating, because he should have won for “Goodfellas”, “Raging Bull”, “Gangs”, “Aviator” …etc etc? I would have to go back to both Infernal Affairs and The Departed to check out the father/son/brothers discourse. Because I have taught Donnie Brasco several times it is much easier to recall. But that’s because Donnie Brasco is essentially a melodrama and The Departed is primarily a gangster drama. That means much more emphasis has to go on the plot and the representation of the milieu in terms of realism (rather than the expressionism of the melodrama?). Why did Scorsese want to make the film? That’s what’s bothering me. As to Hong Kong Cinema and ‘high culture’, for me it’s more interesting because it’s another culture and also because the filmmakers have less money and time and the results are inevitably more raw — and often more emotional.The practice of giving Oscars to filmmakers because they deserve one or becausehey should have got one some time ago does rather devalue the whole concept of the judging process. Scorsese is a cinematic hero for all the things he has done, but if I had the chance the one Scorses film I’d like to see in a new print in the cinema would be Alice Doesn’t Live Here Anymore.